A couple photos from yesterday...one of the best days I have had for photography in a while. I am not sure about the tractors...I always assume a green tractor is a John Deere....did not know till sometime not too far back that the Oliver tractors were green also. I did a quick glance at google pics and am pretty sure these are John Deere but if you know different, feel free to correct me. I would love to have this old truck and have the know-how to fix it up. There is just something about old trucks. Well, even though I drive a Rav4, a truck is my choice of vehicles. We have the Rav for convenience. I really like the new Camaros and the Chargers, but if I had the chance to choose between either one of those and a truck, I would pick a truck any day of the week and six times of Sunday. Do you ever go to a blog post and just cannot find anything nice to say...I am talking more about when I join memes....I like to visit EVERYONE that joins....I know I sometimes honestly miss a few. I only join two simply because I don't have the time to visit a big long list everyday. Well, I have the time most days but have other things I like to do as well. I generally cannot lie and say I love a picture if I don't...have a hard time saying nice if I don't think it is nice. So wondered what your phrase is if the picture does not appeal to you in any way? Usually I can find something to like about almost any photo...it is just every now and then, probably when I am in a mood, I just don't have any words, so rather than asked why in the world they chose to post that particular photo, I don't say anything. Sometimes blogging gets to be a chore...but then there are the people that make it so worthwhile...I have met a quilting buddy through blogging....plus she is a nature lover....she lives in southern Indiana and we both wish we lived closer to each other. Then there is another that just slays me sometimes with her humor. Well, there are a couple that do that....used to be a third but she no longer posts and I miss her humor so much. Her humor reminded me of my older daughter's type of humor. I really don't mean to offend anyone, and heaven knows I have posted my share of photos that are not all that great...and some that only I would like. I do agree with Mildred that blogging is about liking people...and also like Lois, making a comment is a way of acknowledging someone's time and effort....and to encourage them. The thing of just not having anything to say very seldom happens, even in memes. In fact, I am sure there are two or three bloggers that might wish I would limit my comments sometimes. Sometimes it is important to comment on a post of someone you have known for awhile to let them know you have been there. Usually, I do find something interesting about posts and appreciate the time and effort that have gone into getting it on line. Hi Rose, You had a lovely day to capture these old beauties. We have old photos of my great grandpa's truck - wish I had one like it! To me, blogging is about liking folks and having the privilege of checking in with them daily. I don't have a good camera and I'm sure I post a lot of poor quality pics, but for me, blogging is about sharing an experience from our day. I think of my mom being blind but yet she had a perception of beauty from the words used to describe something to her. Oh wow Rose, I've thought these same thoughts a time or two. I've quit doing barn charm as I don't have the time to visit everyone. I still love my barns, but I've realized that I spent more time on the computer than I needed to. I don't comment as much but I still look and read blogs. 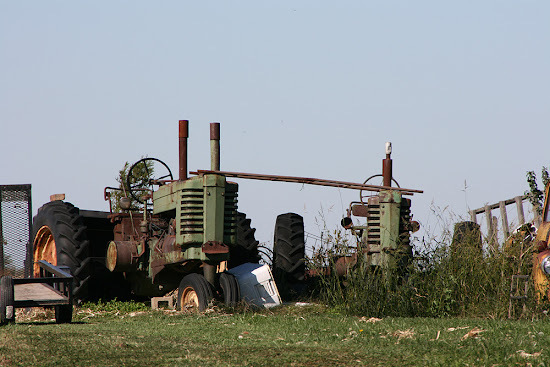 Speaking of green tractors, I noticed that last fall when we went to the tractor show and saw a lot of green tractors and found out that they were Oliver ones. Sorry tho, have no idea what those ones are. I can see you had lovely weather and great subject matter for photos here! i have struggled with what to say, not about photos, but about the content, that is rare though. a couple of times i left and did not comment then went back when i could say something positive. i don't comment on political post at all. other than that i can always think of something positive to say. 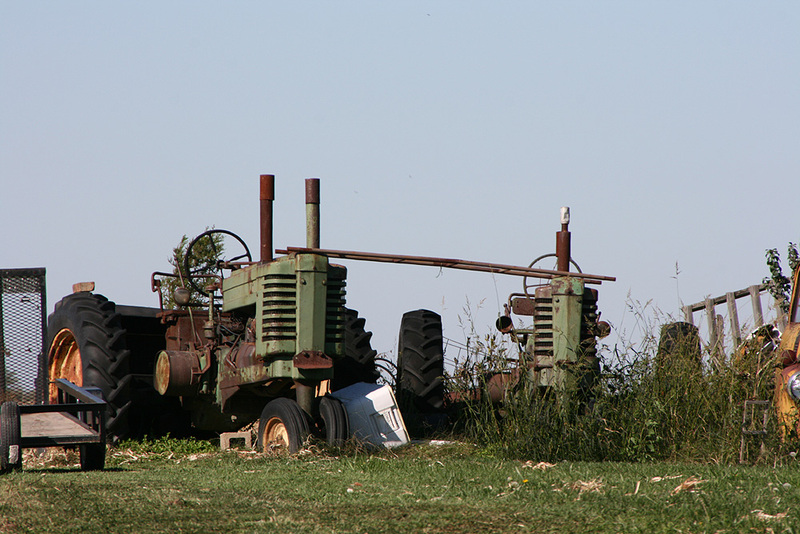 A fine shot of those tractors. The truck is a winner too. Trucks do have a special appeal. The old ones are smaller whereas the current crop seem very huge. I like the looks of the older ones best. I know what you mean about nothing nice to say. Memes really are for the photos. If I can't find something nice about the photo I usually try to relate to something that has been said instead and if that doesn't help me I look at the other comments and try to decide what to write. 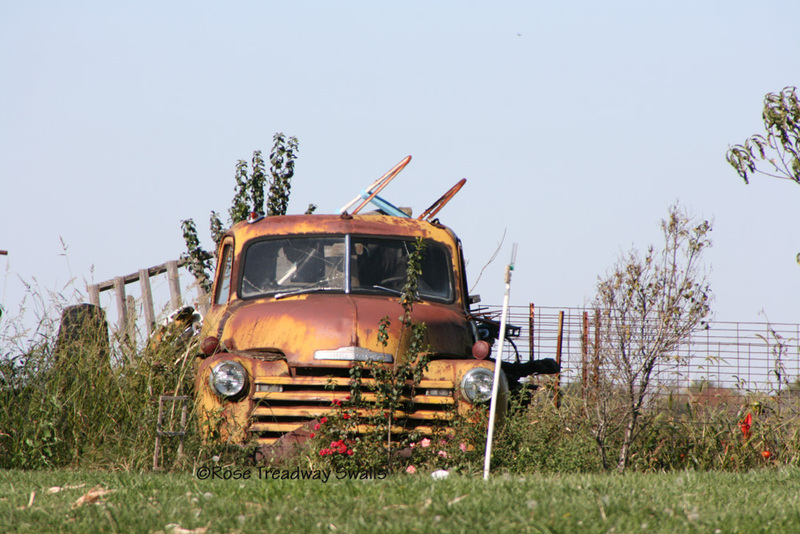 I love that old truck as well Rose, there is just something nice about them isn't there. Sometimes I struggle to find something to say on a blog so tend to not say anything. I also don't always visit everybody in a link up. It is hard to keep up sometimes isn't it? This was an interesting post. Firstly I really liked the old tractor and car. Interesting photos! But it was also of interest what you had to say about blogging...I will OCCASIONALLY find a photo I don't care for, but I can usually find some good in every one. I try to visit every commenter on my blog, and every person who is part of a meme...that's why I got so far behind recently! :-) You're right, it sure does take some time. But the joys outweigh any negatives. I always love your photos. I may not comment, but you are a wonderful photographer and I love your posts. I love to visit blogs, but I have been having a hard time lately keeping up. Kinda wish we would all just do it once a week. But I agree with you, I truly like all my blog friends. They have all (including you) become treasured people in my life. I love that old truck. Sometimes I just can't think of anything to say too. I have cut back on memes and commenting in general too because I just don't have the time. Life happens.